I've been really impressed with Cura's development over the past year or so. 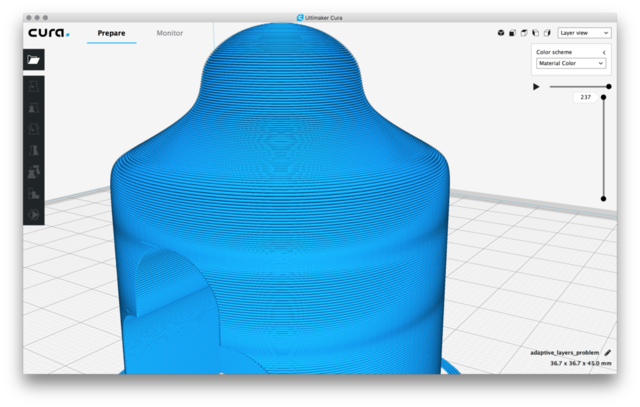 It has become my default slicer because it gives me so much control over just about every print setting, and its GUI is so much more intuitive than its competitors. The way that the new "support blocker" tool works seems pretty nice; maybe "adaptive layer include/exclude" could work in a similar manner? How can your human eyes can identify which layers are identical or not. You are making bad assumption. In addition, if there is 100 layers in the slicing, do you really want to add your human heuristic? There is definitely a visible difference between 0.05 mm layers vs. 0.25 mm, and banding is quite evident when very thin layers are unnecessarily added to fairly straight vertical surfaces. Also, I'd prefer not to waste valuable printing time adding very thin layers to details that are less important to me on a model. I'd be very surprised if I were the only person wishing that the adaptive layers feature had slightly more versatility. For example, if I were much more concerned about eliminating the visible banding on the exterior of this very simple object than having the arched opening printed as nicely as possible, it certainly would be nice to tell Cura to ignore the arched opening when calculating adaptive layers. It would reduce the print time as well. Obviously the problem is exacerbated on more complex models. Boy, you completely misunderstood me. The difference I referred to in my previous comment is the difference of 2D print parts (including infill, shell and etc) between layers. In other words, the parts in each layers must be exact the same if you want to merge two layers in adaptive layers algorithm. I'll have to check out Slic3r's variable layers feature, because it looks like it works pretty much the way I suggested. It's great to have options. Regardless of the implementation of other slicer, to merge two layers you must make sure the parts (inset and infill) must be the same. Otherwise, they can't be merged it together. You can't do it by human eyes. Neither do you want to pick which layers to merge manually. It is a nightmare. I get the impression that you're not quite understanding what I'm asking for here, but OK.
Adaptive layers is to let slicer figure out the variable layer height based on the print content of each layer. It is undesirable for majority users to figure out which two layers are the same and then merge them. I don't think it is intended to solve your banding problem. Find a smaller nozzle that may have a finer print to solve the banding problem you mentioned. 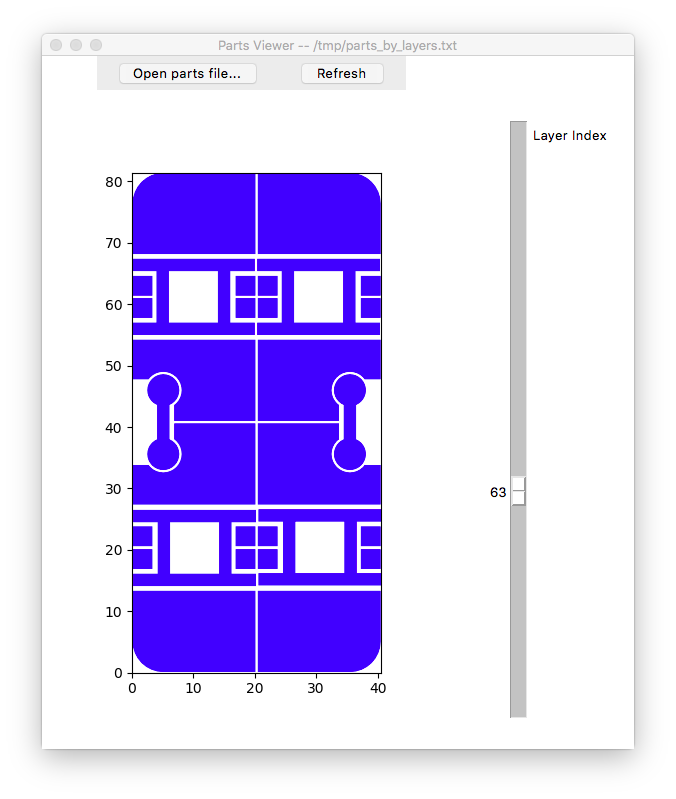 I wrote a matplotlib part viewer tool here, which draw islands layer by layer from the intermediate output I extract from Cura 15.04. You can take a quick look of UI and imagine how bad it is when you make your merging choices for a tall print, where might contain thousands of layers.